"Finding low car insurance quotes for modified cars"
Here is a long overdue article on an often overlooked aspect of Car insurance. Car insurance - all policies state "Has the car been modified, altered or adapted from the manufacturers original specification or has it been tuned. All insurers need to know if a car has been modified. The stats of the insurers generally show that modified cars are involved in more claims, not just accidents but there is a greater likely hood of the car being stolen. There is also the possibility that lower suspension or wider wheels could adversely affect the handling of the car so the model they rated and gave a group to does not apply to your unique vehicle. So an underwriter needs to agree 'terms' of cover. 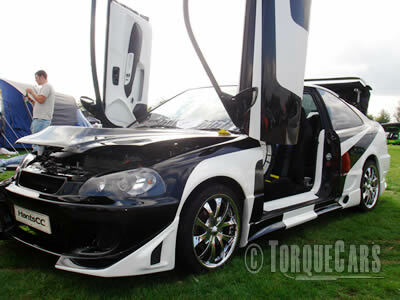 Any modification to your car must be notified to your insurers or you risk invalidating your cover. Even stickers could represent a 'Moral hazard' to the insurers. Failure to notify insurers could render your insurance invalid leaving you to face prosecution for failure to buy adequate car insurance for your vehicle or if a claim is paid on your behalf they could well ask for reimbursement of amounts paid out for you so even if you are Third Party Only you could lose out. Insurance - notification of modifications. When getting car insurance a little paranoia is a good thing. Always keep a copy of all correspondence sent/received in response to a modification being notified to your car insurers. It is helpful if you can detail every modification and even supply a rolling road printout to allow the underwriter to assess your car. Some car insurers may offer car insurance quotes at normal terms (no extra premium), Apply terms (extra premium, & or higher excess & or agreement to replace modified parts with standard parts. As does the difference between a high performance air filter and washable direct replacement air filter. If a chip increases MPG state this as your primary reason for upgrading rather than mention this as a side effect and then state that it also gives slightly more power as a secondary reason. Car insurance companies, contrary to popular belief to want to insure people they just don't like taking on too much extra risk and most of the decision making is done by a person who reviews each case on its own merits. How do insurers set rates for modified cars and custom cars? When setting a car insurance premium for a modified car, an insurer will also look at the base car you started from - diesels are favoured over petrol. A £500 car with a £1000 ICE install and £2000 worth of 20 inch alloy wheels is an obviously increases the risk of the car going 'missing' and most insurers would refuse this unless you agree that they can replace the nicked items with standard parts. When you drive a Group 20 car costing £30,000 and add £2000 of alloy wheels and a £1000 ICE install they are less likely to impose terms. And if the car already does 0-60 in 4 seconds and you modify it to go 0-60 in 3.7 seconds again there is little weight to the argument of an increased premium. Car insurers want to see enthusiasts that love cars and look after them rather than the boy racer who wants to impress his mates in the 7/11 car park. Getting car insurance cover first and then applying modifications later to the car often means the insurer will listen to you whereas they would refuse a new person with no record. Obviously you need to choose a sympathetic car insurer and there are no guarantees but ask you friends who they insure with. Buying an already modified car is also a good bet - you didn't do the mods so theoretically are not so much of a risk to the insurance company. Modified friendly insurers are about and most give excellent terms, this topic crops up frequently in our forum..
TorqueCars members receive up to a 20% discount from selected insurers - so make sure you join our forum to see these offers. Many Lloyds syndicates will also be willing to listen and offer you personalised terms. It is certainly worth contacting a large Broker and let him do the searching and negotiating for you. For standard cars the insurance supermarkets give excellent ranges of prices and make shopping around easier but for modified cars you really need to approach insurers on a 1 to 1 basis, why not also ask our members in our forums and find out who they insure with for an idea on where to start.